Tonight I'm revisiting a revisiting a Russian black metal band that's been featured here a few time before. I'm retrospectively reviewing the 2013 album Atenvx that was released on CD by Metallic Media. Also released on tape by both Hell Division Productions and Apocalyptic Art, Atenvx was Astariun's fourth and latest full-length. It's difficult for studio-only projects to gain and keep traction, especially those from peripheral countries like Russia, so it's testament to SiN's persistence that Astarium is still going strong ten years on from it's formation in 2005. After glancing at the cover art that contains a star-filled sky and a motif that looks like a constellation, you’re propelled deeper into the otherworldly atmosphere of Astarium with opening instrumental Crepuscle. Howl To The Curst is a departure from the stark distance of Crepuscle. It features Astarium’s trademark black metal and SiN’s unique growling vocals. SiN’s lyrics are in English on this release, which makes it more accessible. The symphonic side to Astarium’s sound comes through more on Avernus Legion. I still find it amazing that one person can create music like this without the backing of a full band, even now. Most of SiN’s music with Astarium is self-recorded and played using synths/electronics, yet doesn’t sound artificial. The textures and layers that make up Spiral Of Purgatory, give the song great momentum. The organ-style melody that flows through the song adds more orchestral atmosphere too. It does remind me of an old arcade-game soundtrack, but that comparison is meant with no disrespect to the music on Atenvx. On Lycanthropy Seal, which heralds in the second half of the album, Astarium weave images of the cold Russian winter with the sounds of howling wolves. The ambient piano and strings during the intro passage paints a beautiful picture before minimal black metal takes over. The tracks on Atenvx seem to be very focused, with Judicum Dei being the longest at just over five-minutes. Its that focus and good song-writing that gives this album a lot of momentum. Penultimate song Realm Of Nykta is the last full black hymn on Atenvx and typifies that momentum I was talking about. It’s all rounded out by instrumental track In Stygian Bog, which rumbles to the sound feedback and distant strings. It’s more haunting yet it features some startlingly good jazzy-bass mid-way through. I was not expecting that! It's off kilter and shows a more organic side to Astarium. 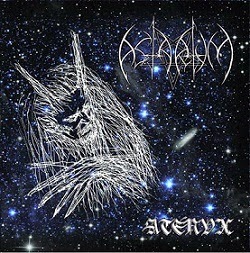 Atenvx is not streaming online, but you can download album track Judicum Dei from Astarium's website here - http://www.astarium.ru/eng/index.html. Teenage Rehab - Break Yourself 7"
Black Years - Black Years II 7"